Benazir Bhutto (born in Karachi, Pakistan, June 21, 1953) is the first woman to lead a Muslim state in the post-colonial era. The charismatic Bhutto was elected Prime Minister of Pakistan in 1988, but 20 months later, the president deposed by the country's military-backed, Ghulam Ishaq Khan who controversially used the 8th Amendment to dissolve parliament and force an election. Bhutto was re-elected in 1993, but was dismissed three years later amid various corruption scandals by then president of the ruling, Farooq Leghari, who also used the powers given special consideration by the 8th Amendment. Bhutto was the eldest son of former Prime Minister of Pakistan, Zulfikar Ali Bhutto (who was hanged by the military government in Pakistan under exceptional circumstances) and Begum Nusrat Bhutto, an Iranian Kurds. Her paternal grandfather was Sir Shah Nawaz Bhutto, a Sindhi and a key figure in the independence movement of Pakistan. Bhutto was studying in kindergarten Lady Jennings and then Convent of Jesus and Mary in Karachi. After two years of study at the Rawalpindi Presentation Convent, she was sent to the Jesus and Mary Convent at Murree. She passed her O-level examinations (in the British education system, the equivalent of high school grade 1). In April 1969, he was accepted at Radcliffe College, Harvard University. In June 1973, Benazir graduated from Harvard with a degree in political science. He was also elected to Phi Beta Kappa. He then entered the University of Oxford in the fall of 1973 and graduated with a Masters degree in Philosophy, Politics, and Economics. She was elected president of the prestigious Oxford Union. After completing his university education, Bhutto returned to Pakistan, but because his father was imprisoned and later executed, he was placed under house arrest. Once allowed to return to England in 1984, he became the leader of the Pakistan Peoples Party (PPP), the party of his father, in exile, but he can not make his political power can be felt in Pakistan until the death of General Muhammad Zia-ul-Haq. On 16 November 1988, in a first open election in more than a decade, Bhutto's party, the PPP, managed to get a number of seats in the National Assembly. Bhutto was sworn in as Prime Minister of a coalition government on December 2, 1988 and by age 35 he became the youngest person and the first woman to lead a nation with a majority Muslim people in modern times. After being sacked by the then president of Pakistan on corruption charges, Bhutto's party lost the general elections held in October. He became leader of the opposition while Nawaz Sharif became prime minister for the next three years. When elections were held again in October 1993, which was won by a coalition of PPP, which Bhutto return to the office until 1996, when the government once again dismissed on charges of corruption. Bhutto was accused of corruption but later cleared his name. He is also accused of money laundering states in Swiss banks, in a case that still remain in the Swiss courts. Her husband, Asif Ali Zardari, languished for eight years in prison, although he was never convicted. He was placed in a separate detention and torture confessed. Groups of human rights also claim that their rights have been violated Zardari. Former prime minister Nawaz Sharif recently apologized for his involvement in the prolonged detention on Zardari and filed cases against Bhutto. Zardari was released in November 2004. Benazir since 1999 living in exile in Dubai, United Arab Emirates, and there he was caring for the child and his mother who suffers from Alzheimer's disease. He also travels the world to give lectures and keep links with the Pakistan People's Party supporters. 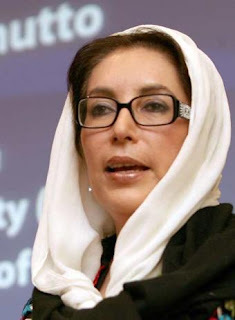 Benazir and three children (Bilawal, Bakhtawar, and Asifa) were reunited with her husband and their father in December 2004 after more than five years apart. Bhutto has vowed to return to Pakistan and run for prime minister again in elections scheduled for November 2007. Dated October 18, 2007, he returned to Pakistan to prepare for facing elections. On the way to a meeting, two bombs went off near a group that carries it. Bhutto survived, but at least 126 people were killed in the incident.